You’re invited into a deeper and more authentic Life with God. If you have struggled to learn what it means to live your life with God or if you have been looking for a fresh way to read the Bible, The NRSV Life with God Bible will help you rediscover Scripture as living text, rich with insights into how to live your life more intimately with the Creator. Spearheaded by bestselling authors Richard J. 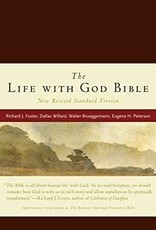 Foster and Dallas Willard, alongside the foremost names in Christian spirituality and biblical scholarship, The NRSV Life with God Bible introduces the concept of the “with-God life,” a model for seeing the whole of Scripture as the unfolding story of God’s plan for our loving relationship with God. This theme weaves throughout the essays and study notes, while the concrete practices and spiritual disciplines, such as prayer, worship, fasting, and celebration will help you discover a deeper relationship with God and transform you into the likeness and character of Jesus.